The MODIS/VIIRS Fixed Sites Subsetting Tool provides customized subsets and visualizations of several MODIS Collection 6 and VIIRS (Version 001) land products for 2000+ selected field and flux tower sites around the world. Spatial subsets of the land products are available for predefined areas (approximately 8.5 by 8.5-km) centered on each site. Users select a site and data product through the graphical web interface and are directed to a page with options for data download and visualizations. Fixed sites are included at the request of measurement networks, research programs, and individual researchers. Subsets of each available MODIS and VIIRS land product are pre-processed and indexed for the roughly 8.5 by 8.5-km footprint surrounding each fixed site to allow for instantaneous visualization and download of the data. The time series for each product is routinely updated as new data become available. Fixed sites are searchable by site name, country, or network affiliation through the MODIS/VIIRS Fixed Sites Subsetting Tool portal. Data are available for download in comma separated value (*.csv) and GeoTIFF (.tif; sinusoidal projection) format. Figure 1. Pre-processed MODIS and VIIRS land product subsets are available for 2000+ sites around the globe. Please refer to Section 5 of this document and to the MODIS/VIIRS Citation Policy page for more information on how to cite your subsets. The data products available through the MODIS/VIIRS Fixed Sites Subsetting Tool are generated by instruments on three satellite platforms: the MODIS instruments flown on NASA's Terra and Aqua satellites, and the VIIRS instrument flown on Suomi NPP. MODIS products from Terra are available from February 2000 to present and Aqua products are available from June 2002 to present. They are available for daily, 4-day, 8-day, 16-day, and annual composite periods at 250-m, 500-m, or 1-km resolution, depending on the product. VIIRS products are available from January 2012 onward. Data in spatial file formats are available in sinusoidal and geographic (WGS84) projections. Please refer to the MODIS/VIIRS Documentation page for a list of available data products. The Fixed Sites Subsetting Tool streamlines the use of MODIS and VIIRS land product data for characterization of field sites, rapid time-series visualization, validation of models and other remote sensing products, and other research activities. See here for a list of publications that have used Fixed Sites subsets from the ORNL DAAC. The results of routine quality assessments are maintained at the MODIS Land Quality Assessment (MODLAND) site by the MODIS Land Science Team and provided through product metadata and per-pixel information for each MODIS granule. Similar quality assessments are performed by the NASA Suomi NPP Land Science Team. More information about VIIRS validation is available at the Suomi NPP VIIRS Land site. MODIS and VIIRS tiles are provided to the ORNL DAAC by the Land Processes DAAC (LP DAAC). Subsets of each available product are pre-processed and indexed for the roughly 8.5 by 8.5-km footprint surrounding each fixed site to allow for instantaneous visualization and download of the data. The time series for each product is routinely updated as new data become available. Fixed sites are searchable by site name, country, or network affiliation through the MODIS/VIIRS Fixed Sites Subsetting Tool portal. For your convenience, you will receive citations for your order and the MODIS or VIIRS product in the order delivery email. Users should include both a citation to the subsetting tool itself and a citation to the specific product(s) used as references in subsequent manuscripts. Citations for available products are included in the references section of this document. Please refer to the MODIS/VIIRS Citation Policy page for more information on how to cite your data subsets. The tool is accessed via the link on the MODIS/VIIRS Get Data page. Users are required to log in with their NASA Earthdata login information before downloading data. 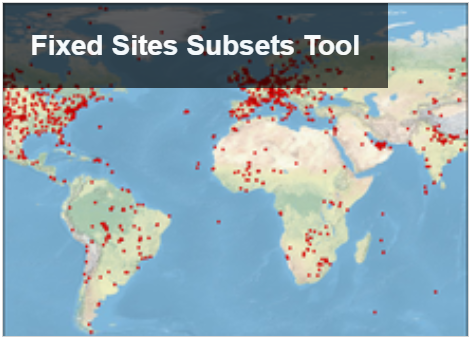 Fixed sites are searchable by site name, country, or network affiliation through the MODIS/VIIRS Fixed Sites Subsetting Tool portal. Sites may be selected on the map or from the list. A list of available land products is displayed upon selecting a site. Selection of the desired product directs the user to the visualization page specific to that site and product. The fixed site visualization page provides details about the subset area, visualizations, quality assurance information, citations, and download links. Users have the option to visualize data from individual composite dates by clicking the Visualize Subset Area by Dates button. Check the Stack by Year box to visualize a stacked yearly time series. Coarse and fine adjustments to the temporal range for Stacked and Default time series plots can be made using the sliders at the top of the page and directly below the plots. IGBP land cover classification, vegetation phenology, and various plots (and plotting scripts written in R) are accessible for subset data near the bottom of the visualization page. A collection of example classroom exercises is maintained on the MODIS/VIIRS Land Products Subsets page. The exercises have been provided by instructors from various institutions to help students and researchers understand the basic concepts of remote sensing as well as the use of the subsetting and visualization tools provided by the ORNL DAAC. Version 1.1 of this tool added support for data products from VIIRS. Version 1.0 of this tool offered MODIS Collection 6 land products and replaced the previous tool which offered MODIS Collection 5 land products.